About Us - Leslie R.Trimble,D.C.,C.A.C. Leslie R. Trimble, D.C., C.A.C. Dr. Leslie Trimble earned her Doctorate of Chiropractic in 2009 from Logan Chiropractic College located in Chesterfield, Missouri. Dr. Trimble has a Bachelor of Science Degree in Business Administration from the University of Kansas and also holds a Bachelor of Science Degree in Life Sciences from Logan University. At this time, Dr. Trimble holds state licenses in Illinois and Missouri. Dr. Trimble has lived in the Quincy, Illinois area since 1992. After her Irish Setter, Maggie and her Paint horse, Journey received 'adjustments' that totally changed their lives, she decided to change her life and career path to pursue a chiropractic degree. She completed her animal coursework from Parker Chiropractic College in Dallas, Texas and was awarded certification by the Animal Veterinary Chiropractic Association (AVCA) in 2010. She has worked closely with her mentor, Dr. Shanie Cahill D.C., for over the last 10 years. In addition to animal chiropractic, she is trained in Logan Basic, Advance Basic, Diversified, Thompson and Activator techniques. 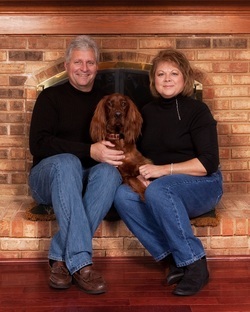 Dr. Trimble's family includes her husband Jay, and Murphy (aka 'The Murphinator') an Irish Setter. A Quincy native, Diana brings 20 plus years of experience to our office. She will be handling the scheduling, office work and will be assisting in letting Murphy in and out (this is a full time job)! Diana has 2 cats - Sophie and Whiskers!